The people you contact most often are deserving of their own contact shortcuts on the Galaxy Tab Home screen. You just don’t realize how useful such a thing is until you have one. Choose a contact from the Contacts list. Preferably, choose someone whom you frequently and electronically contact. An icon representing the contact appears on the screen. If the contact has an associated picture, you see the picture. Otherwise, you see a generic contact icon, but it has a teeny menu indicator in the lower-right corner. If you touch the contact, that menu appears, displaying a list of quick tasks for the contact. Choose a quick task for a contact by touching the task’s icon. For some contacts with lots of quick tasks, you may have to scroll the quick tasks left or right to see them all. 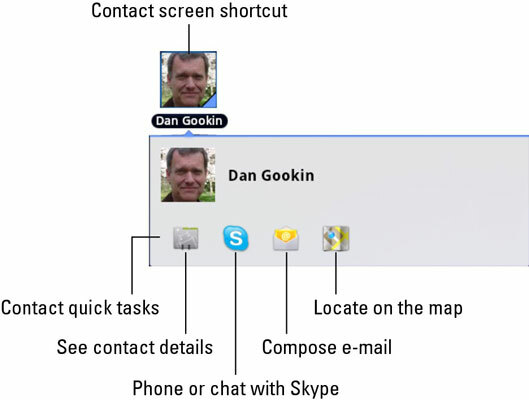 The number of quick task icons that appears for a contact depends on how much information you have available for the contact, such as e-mail address; cell phone number (for texting); or linked contacts for Facebook, Skype, Twitter, and so on. When multiple sources, such as e-mail addresses, exist for a contact, you may also see a settings or wrench icon. Choose that icon to select which accounts to use for the quick tasks. To hide the quick contact information, simply touch another part of the Home screen or press the Back icon button. A contact’s Facebook status may appear beneath the name. Just touch the contact screen shortcut to see the quick tasks. When you long-press the shortcut, the Galaxy Tab believes that you want to move or delete the icon.